Background Although supporting lifestyle change is an effective way of preventing further events in people with cardiovascular disease, providing access to such interventions is a major challenge. This study aims to investigate whether simple reminders about behaviour change sent via mobile phone text message decrease cardiovascular risk. Methods and analysis Randomised controlled trial with 6 months of follow-up to evaluate the feasibility, acceptability and effect on cardiovascular risk of repeated lifestyle reminders sent via mobile phone text messages compared to usual care. A total of 720 patients with coronary artery disease will be randomised to either standard care or the TEXT ME intervention. The intervention group will receive multiple weekly text messages that provide information, motivation, support to quit smoking (if relevant) and recommendations for healthy diets and exercise. The primary end point is a change in plasma low-density lipoprotein cholesterol at 6 months. Secondary end points include a change in systolic blood pressure, smoking status, quality of life, medication adherence, waist circumference, physical activity levels, nutritional status and mood at 6 months. Process outcomes related to acceptability and feasibility of TEXT ME will also be collected. Ethics and dissemination Primary ethics approval was received from Western Sydney Local Health Network Human Research Ethics Committee—Westmead. Results will be disseminated via the usual scientific forums including peer-reviewed publications and presentations at international conferences. Clinical trials registration number ACTRN12611000161921. 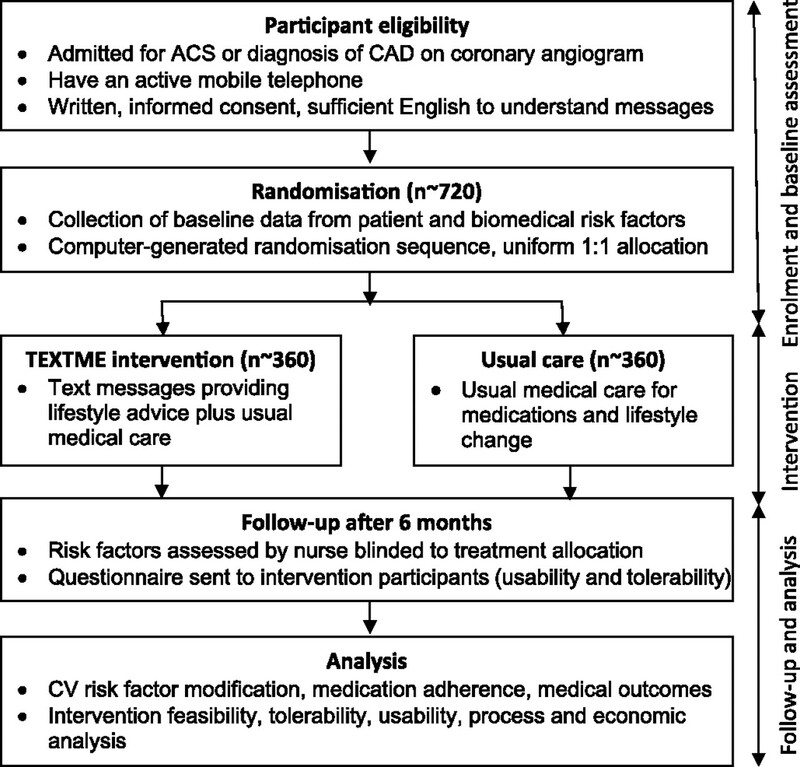 The article provides the rationale and protocol for a randomised controlled trial to test the efficacy of mobile phone text message reminders to promote behaviour change and reduce cardiac risk in patients with coronary heart disease. Mobile phone text messages may potentially be a cheap, safe and simple way to promote healthy behaviour, improve mood and increase compliance with cardiac medication. This in turn would reduce cardiovascular risk. The effectiveness of this approach needs to be tested in well-designed and rigorously conducted clinical trials. The main strengths of the current study are that it uses a simple and inexpensive text message-based programme that is suitable for widespread use and will test this strategy in a randomised, controlled and blinded study. The study is, however, being conducted in only Australian tertiary centres and, therefore, the generalisability is somewhat limited, although the cohort size is relatively large. Unfortunately, despite the efficacy of these programmes, there is substantial underutilisation of existing programmes internationally. In the USA,4 UK3 and Australia,7 8 only about a third of eligible patients participate in cardiac rehabilitation. Furthermore, non-attendees are at higher baseline risk and have poorer risk factor knowledge than those accessing rehabilitation.9 These challenges have resulted in the development and testing of a wide range of alternative cardiac rehabilitation models (now becoming known as secondary prevention programmes) over the past 10 years. These, more contemporary programmes, involve in isolation or combination, in-person visits, community services and home manuals with phone/electronic support for flexible and individualised management of CHD.6 A recent systematic review also found that ‘telehealth’ secondary prevention interventions (including programmes delivered via telephone, internet or videoconferencing) provide effective CVD risk factor reduction.10 However, there has been limited success in the translation of these programmes from trial to clinical practice and minimal data on feasibility. Overall, there is good evidence that secondary prevention programmes aimed at modifying health behaviours including smoking, exercise and diet are effective, but they are consistently underutilised. The complexity, number and diversity of available programmes also raise concerns that they may be difficult to replicate cheaply in different settings. In addition, despite evidence that depressed mood may impair a patient's response to behaviour change or medical adherence, very few secondary prevention programmes describe mood or depression as a focus of management.11 Ultimately, there is unlikely to be one perfect programme. Therefore, more exploration is required regarding simple methods to enhance currently effective programmes. The delivery of short messages to mobile phones using Short Message Service (SMS), also known as text messaging, is a common, convenient, rapid and cheap method of communication globally. The international technology consulting firm Ovum estimates approximately 1.25 trillion SMS messages were sent globally in 2005.15 A few recent studies have evaluated the effectiveness of mobile phone text messaging to change individual health behaviours, including smoking, weight loss and physical activity or to improve the medical management of diabetes16 or adherence to medication.17 However, no known trial to date has addressed multiple risk factors for CVD management. Reducing multiple risk factors concurrently, rather than targeting single factors is likely to deliver greater reduction in events.18 A recent systematic review of behaviour change interventions delivered by mobile phone text messages identified 14 relevant studies from peer-reviewed journals in English.19 The authors reported that SMS-delivered interventions had positive short-term behavioural outcomes. However, a number of studies were of poor quality as most had limited statistical power and no process outcomes. Only a few studies are sufficiently large enough or powered to effectively examine the effect size of SMS interventions.20–22 A recent Cochrane review of 1905 participants summarised the results for smoking.20 The majority of participants from this review was from one trial of a SMS-only intervention study that included a total of 1905 smokers and found that those receiving interventions were approximately twice as likely to quit smoking in the short term (RR 2.18, 95% CI 1.80 to 2.65). The randomised controlled trial evidence examining effects on weight or physical activity are considerably smaller than that for smoking cessation.21 22 Overall, while there is some evidence around the benefit of SMS for facilitating behaviour change for individual risk factors, there are no known studies investigating the role of SMS in managing multiple risk factors in people with CVD. Therefore, the primary objective of this study was to determine the impact of a programme of lifestyle information, motivation and support sent via mobile phone text messages on cardiovascular risk factors, quality of life and mood in a population of patients with known CHD. In addition, this study will investigate the acceptability, feasibility cost-effectiveness of delivering a SMS-based intervention in this setting. TEXT ME is a single-blind randomised controlled trial with 6 months of follow-up (figure 1) (ACTRN12611000161921). The study will be conducted at two large metropolitan tertiary referral public hospitals in Australia that serve an ethnically, culturally and socioeconomically diverse population. A total of 720 patients admitted to hospital with an ACS or evidence of coronary artery disease on coronary angiogram will be included. Participants will be randomly allocated to either the control or intervention group. The control group will participate in standard care and the intervention group will participate in the TEXT ME programme and will receive behaviour change reminders via SMS text message in addition to standard care. Blinded assessments will be conducted at baseline and 6 months during a face-to-face interview. Study design and flow. ACS, acute coronary syndrome; CAD, coronary artery disease; CV, cardiovascular. Randomisation will occur via a computerised randomisation program that will be accessible by study staff with username and password through a web interface. The random allocation sequence will be in a uniform 1:1 (control:intervention) allocation ratio and will be concealed from study personnel until the completion of the trial. Study personnel taking follow-up assessments will also be blinded to parallel group assignments. Patients admitted to tertiary referral hospitals, in Sydney Australia, over a 24-month period with documented CHD will be eligible for the study. These patients are at high risk of future cardiovascular events and are likely to be motivated to change their lifestyle. Patients will be eligible if they have been admitted to hospital with an ACS and/or have angiographically confirmed coronary artery disease (>50% stenosis in a least one major vessel) (identified during inpatient admission or though outpatient clinics), if they provide informed consent, have an operational mobile telephone and have sufficient English language skills to provided informed consent and understand the text messages. For those people who are ineligible or decline to participate, we will keep a ‘screening log’ of basic demographic information and reasons for non-participation. The control group will receive ongoing standard care for their cardiovascular health, including pharmacotherapy and lifestyle counselling as determined by their usual doctors. The TEXT ME intervention group will receive ongoing standard care as well as regular text messages via SMS over a 6-month period. These messages will be unidirectional and will serve as reminders but will not allow two-way communication with a researcher or health professional about clinical management. The messages will provide advice, motivation, information and support to quit smoking (if relevant) and engage in healthy diets and exercise (box 1) and will reinforce the initial advice and counselling received in hospital. Participants will not be expected or asked to respond to text messages they receive. All participants will be offered brief training at enrolment on how to read a text message and how to delete or save messages. All participants will be provided with the contact details of research personnel and contacted at least once during the intervention period to facilitate follow-up. A researcher will manage a mobile telephone that will receive any messages received from the participant's phones. This researcher will not participate in any individual level of analysis and will keep a record of all messages received from participants throughout the course of the study. Participants will have the opportunity to withdraw via a text message and the researcher will contact the software manager in order to activate the withdrawal. If the TEXT ME mobile phone receives a messages indicating that a participants mailbox is full, the researcher will contact the participant to discuss but will not provide any medical advice. A ‘bank’ of 100 text messages have been systematically developed through an iterative process and based on current national guidelines.23 The messages are categorised into four groups including (1) general heart health information messages that include facts about CVD and information about medications and risk factors, (2) nutrition messages, (3) physical activity messages and (4) smoking cessation messages (box 1). Each message is <160 characters and is suitable for people of any age or gender. The initial ‘bank’ of draft messages was scrutinised and modified by an expert review panel made up of a multidisciplinary group of clinicians (including cardiologists, a psychologist, a physiotherapist, nurses and public health specialists), researchers and academics. The final draft bank of text messages was then evaluated by 53 consumers completing a qualitative questionnaire. This survey asked for comment and feedback about usefulness and understanding for specific text messages. Feedback from the surveys was then addressed and a final ‘bank’ of messages was prepared ready for use in the TEXT ME intervention. Each participant in the TEXT ME intervention group will receive four messages per week for 24 weeks. These will be sent at one of four random times (9:00, 12:00, 15:00, 17:00) and on four of five random week days. Non-smokers will receive one general heart health and medication messages, one nutritional message, one physical activity message and one random message from one of the above groups per week. Smokers will receive one general heart health and medication message, one nutritional message, one physical activity message and one smoking cessation message per week. Messages will include the recipients preferred name and will be received in random order, and no message will be repeated. Prior to commencement, a semi-personalised test SMS will be sent to each participant to ensure the correct telephone number has been recorded and that the system is working effectively. The management of message delivery will be by the TEXT ME software program. This is a specifically designed, computerised software messaging engine developed by programmers with input from the research team.24 25 The software program has an entry page to input specifications such as start and end date, mobile phone number and inclusion/exclusion of smoking cessation messages. The program will keep a log of all messages sent to each study participant and those which fail to be delivered. The messaging engine will send messages through a gateway interface to enable them to be sent to all participants on any Australian phone network at no cost to the participant and at a bulk-rate cost to the study. Data exports will be compliant with privacy legislation, centrally managed by the George Institute and held in strict confidence. There will be no access to these data by any third party, including the software developers. For process measures, we will keep a log of the level of competence with text messaging of participants at study entry and thus the requirement for text message training. Logs will be kept to assess the time messages are sent and the proportion of text messages successfully delivered (eg, if mobile phone mail boxes are full). A log will be kept of how many participants contact the study team, the reason for contact and the method used for contact (eg, by telephone, email). To examine acceptability and feasibility of TEXT ME, participants allocated to the intervention group will also be administered an additional questionnaire, after the blinded 6-month follow-up assessment. The questionnaire will include items that address the acceptability of repeated text messages, identification of which messages participants remembered, liked or disliked, what they did with messages (eg, kept them or deleted them immediately), their perceived utility of the text message and their opinion regarding the intrusiveness, timing and content suitability of the text messages. At follow-up, information will be recorded about attendance at a secondary prevention programme such as cardiac rehabilitation and approximate frequency of visits to healthcare provider(s). To obtain a more in-depth understanding of the potential barriers and facilitators at the service delivery and individual level to uptake of this programme, we will also conduct semistructured interviews with a subsample of participants in the intervention group. Recruitment for the interviews will be purposive to maximise variation such as urban/rural location, practice size and degree of participation for providers; and location, gender and age for patients. Sampling will continue until no new themes or categories emerge from the data (the so-called thematic saturation).31 We anticipate from previous experience the need to conduct approximately 40 patient interviews. The interviews will be conducted face-to-face by a project officer with experience in qualitative interviews. Where appropriate, interviews will be peer-to-peer. Participants will be asked whether they liked the program, perceived it to be effective, whether the program language was appropriate and understandable, which messages they remembered, liked or disliked, their perception of the intrusiveness, timing and content. Interviews will be digitally recorded and transcribed. Interview transcripts and socio-demographic data will be entered as a project in NVIVO (QSR NVIVO7, Doncaster, Australia), a program for managing and analysing qualitative data. The NVIVO software enables multilevel coding of text against a set of identified analytical categories. The study team will use an iterative process to understand the themes and key issues arising from the data. The expected change to economic costs and health outcomes from widespread adoption of the TEXT ME intervention will be estimated with cost-effectiveness analysis. A health sector perspective will be adopted and values collected for variables that describe the participant's use of acute and primary care health services. A number of brief questions will be included in the data collection, and consent will also be sought for access to individual participant Medical Benefits Schedule and Pharmaceutical Benefits Scheme claims usage through Medicare Australia to ascertain use of medical services (GP, specialists and non-hospital diagnostic tests) and prescribed pharmaceuticals. These costs will be valued using market prices, or shadow prices will be imputed. The costs of delivering the intervention will be assessed by measuring and valuing the incremental resources used.32 Changes to health benefits will be assessed using quality-adjusted life-years. They will be assessed at each data collection point using the SF-12 Health Survey and converted to short form 6-dimension (SF-6D) utility values via an algorithm developed by Brazier and colleagues.33 Although we do not expect significant differences in survival or quality of life between treatment groups within trial, these data are needed to provide an estimate of the baseline quality of life in this patient population. A non-significant difference in mean health benefits has great value for estimation studies because making a decision with uncertainty, rather than testing a hypothesis, is the goal. Given the likely small numbers of CVD events occurring within the trial, the quality of life and costs data collected in-trial will need to be augmented by data on quality of life and cost associated with CVD events and associated outcomes derived from literature review.34 35 Longer terms costs and quality-adjusted life-years will be modelled using a decision analytic Markov model. The advantage of using the Markov model is that we can extrapolate beyond the data collection period and describe longer term costs and benefits of the intervention. While this method enables longer term costs and outcomes of the intervention to be forecast, the decision uncertainty will increase. To appropriately quantify uncertainty, Monte Carlo re-samples will be drawn from probability distributions specified for all model parameters. Cost-effectiveness acceptability curves will be plotted and used to inform the adoption decision. The expected value of perfect and partial information will be estimated to inform future data collection. Plausible values for discount rates will be used. Intention-to-treat principle will be followed, and characteristics will be compared between the groups at 6-month follow-up using independent t tests for continuous variables (LDL, body mass index, systolic blood pressure and physical activity) or χ2 tests for categorical variables (smoking status, combined risk and medication use) as appropriate. Mann–Whitney U tests will be used where data are not normally distributed. The mean level of each risk factor between groups will also be compared in terms of relative risks, 95% CIs and two-sided p values for achieving the guideline level of each risk factor. Sample size calculations are focused on difference in objective measures of outcomes between intervention and control groups. All calculations are for 90% power with a two-sided α and assume a ratio of 1:1 for intervention to control subjects. Mean and SD for the controls are based on that reported by the normal care arm of the Australian COACH study on lipid levels.36 To test for a difference of 0.25 mmol/l in LDL cholesterol (assuming a mean in control arm of 2.94 mmol/l, SD 0.96 mmol/l), we would require a sample size of 634, rising to 704 allowing for a 10% loss to follow-up. The findings of this study will be disseminated via the usual scientific forums, including peer-reviewed publications and presentations at international conferences. The study will be administered by the George Institute, with the design and conduct overseen by a project management committee (authors). This committee has expertise in large-scale clinical trials and qualitative research, economic analysis, clinical CVD management and healthy policy implementation. This study will adhere to the National Health and Medical Research Council ethical guidelines for human research. Formal ethical approval for this study has been obtained from Western Sydney Local Health Network Human Research Ethics Committee (Westmead). Written and informed consent will be obtained from all participants. This study will evaluate an innovative means of reducing cardiovascular risk factors in individuals at high risk of having a heart attack or stroke by using cheap and widely used mobile phone text messaging technology. Only a few studies exist testing the use of mobile phone text messages to modify single cardiovascular risk factors, such as smoking. No known studies have previously evaluated the acceptability, feasibility and efficacy of a text message-delivered intervention for addressing multiple cardiovascular risk factors in persons with established disease. Therefore, the present study will be the first to provide reliable data about the effectiveness of a text message intervention for managing multiple cardiovascular risk factors. While there is clear evidence that secondary prevention strategies are often effective,6 there is also clear evidence that they are commonly underutilised.3 4 8 Mobile phone interventions that are simple, inexpensive and use current technology could potentially be a useful complement to existing prevention programmes. Ultimately, this would enable the delivery of advice regarding CVD prevention to greater numbers of people, including those in resource poor settings and in geographically isolated communities. The potential value of a text-message-delivered intervention could be great as it could be easily expanded to reach many mobile phone users at a relatively low cost. Overall, a number of questions remain about the feasibility and efficacy of text message-based intervention programmes, particularly in men or older age groups who have greater cardiovascular risk. A rigorous study is needed to evaluate the effectiveness of this intervention and following this, its cost-effectiveness. In addition, the content, level of personalisation, frequency of text messages sent and level of interaction between message sender and receiver varies greatly between studies, and it is unclear from prior research what characteristics of text messages or text message-based intervention programmes are optimal. The current study will explore some of these important issues. In conclusion, TEXT ME will test the utility of a text messaging-based intervention to reduce cardiovascular risk factors in patients with known CHD. This strategy has enormous potential as a cheap, safe and simple method to improve uptake and adherence to behaviour change and ultimately improve cardiovascular risk in millions of people with mobile telephones. However, its effectiveness must be proven in well-designed and rigorously conducted clinical trials. World Health Organisation. The Top 10 Causes of Death. 2008. Fact sheet N°310. http://www.who.int/mediacentre/factsheets/fs310/en/index.html (accessed 16 Feb 2010).
. Secondary prevention programmes for coronary heart disease: a meta-regression showing the merits of shorter, generalist, primary care-based interventions. Eur J Cardiovasc Prev Rehabil 2007;14:538–46.
. Provision, uptake and cost of cardiac rehabilitation programmes: improving services to under-represented groups. Health Technol Assess 2004;8:1–152.
. Use of cardiac rehabilitation by Medicare beneficiaries after myocardial infarction or coronary bypass surgery. Circulation 2007;116:1653–62.
. Association of diet, exercise, and smoking modification with risk of early cardiovascular events after acute coronary syndromes. Circulation 2010;121:750–8.
. An integrated and coordinated approach to preventing recurrent coronary heart disease events in Australia: a policy statement from the Australian cardiovascular health and rehabilitation association. Med J Aust 2009;190:683–6.
. Utilisation of outpatient cardiac rehabilitation in Queensland. Med J Aust 2003;179:341–5.
. High risk-factor level and low risk-factor knowledge in patients not accessing cardiac rehabilitation after acute coronary syndrome. Med J Aust 2007;186:21–5.
. Telehealth interventions for the secondary prevention of coronary heart disease: a systematic review. Eur J Cardiovasc Prev Rehabil 2009;16:281–9.
. Depression and the heart: a systematic overview of definition, measurement, consequences and treatment of depression in cardiovascular disease. Eur J Cardiovasc Nurs 2002;1:45–55.
. Mammographic density does not differ between unaffected BRCA1/2 mutation carriers and women at low-to-average risk of breast cancer. Breast Cancer Res Treat 2010;123:245–55.
. Orientations in adolescent use of information and communication technology: a digital divide by sociodemographic background, educational career, and health. Scand J Public Health 2007;35:95–103.
. Intensity of mobile phone use and health compromising behaviours—how is information and communication technology connected to health-related lifestyle in adolescence? J Adolesc 2005;28:35–47.
. A randomized controlled trial of Sweet Talk, a text-messaging system to support young people with diabetes. Diabet Med 2006;23:1332–8.
. Effectiveness of an intervention to provide information to patients with hypertension as short text messages and reminders sent to their mobile phone (HTA-Alert). Aten Primaria 2004;34:399–405.
. Current and future directions of cardiovascular risk prediction. Am J Cardiol 2006;97:28A–32A.
. Behavior change interventions delivered by mobile telephone short-message service. Am J Prev Med 2009;36:165–73.
. Mobile phone-based interventions for smoking cessation. Cochrane Database Syst Rev 2009;(4):CD006611.
. A text message-based intervention for weight loss: randomized controlled trial. J Med Internet Res 2009;11:e1.
. Using internet and mobile phone technology to deliver an automated physical activity program: randomized controlled trial. J Med Internet Res 2007;9:e7. Heart Foundation of Australia. Healthy Living. 2009. http://www.heartfoundation.org.au/Healthy_Living/Pages/default.aspx (accessed 11 Mar 2010).
. Txt2stop: a pilot randomised controlled trial of mobile phone-based smoking cessation support. Tob Control 2009;18:88–91.
. A multimedia mobile phone-based youth smoking cessation intervention: findings from content development and piloting studies. J Med Internet Res 2008;10:e49. ; ADVANCE Collaborative Group. Intensive blood glucose control and vascular outcomes in patients with type 2 diabetes. N Engl J Med 2008;358:2560–72. World Health Organisation. Global Physical Activity Questionnaire (GPAQ) Analysis Guide. 2011. http://www.who.int/chp/steps/GPAQ/en/index.html (accessed 7 Sep 2011).
. Breath analysis to detect recent exposure to carbon monoxide. Postgrad Med J 2002;78:233–7.
. Performance of the PHQ-9 as a screening tool for depression after stroke. Stroke 2005;36:635–8.
. The significance of saturation. Qual Health Res 1995;5:147–9.
. The estimation of a preference-based measure of health from the SF-36. J Health Econ 2002;21:271–92.
. Event rates, hospital Utilization, and costs associated with major Complications of diabetes: a multicountry comparative analysis. PLoS Med 2010;7:e1000236.
. Cost-effectiveness analyses and modelling the lifetime costs and benefits of health-behaviour interventions. Chronic Illn 2006;2:97–107.
. Coaching patients On Achieving Cardiovascular Health (COACH): a multicenter randomized trial in patients with coronary heart disease. Arch Intern Med 2003;163:2775–83. Funding This work is supported by a National Heart Foundation of Australia Grant-in-Aid (G10S5110) and a BUPA Foundation Grant. CKC is funded by a Sidney Sax Public Health Fellowship co-funded by the National Health and Medical Research Council (NHMRC) and National Heart Foundation (512119) and Sydney Medical Foundation Chapman Fellowship. JR is funded by a Postdoctoral Fellowship co-funded by the NHMRC and National Heart Foundation (632933). MH is in receipt of an NHMRC Career Development Award (632925). SJ is funded by an NHMRC Career Development Award (457117). GSH is funded by a New South Wales Office for Science and Medical Research, Life Sciences Research Award. The organisations that supported this work (through peer-reviewed educational research grants) had no role in study conception, data collection, analysis and interpretation and writing of the manuscript. All authors had full access to the data. All authors had the final responsibility for the decision to submit for publication. Ethics approval The study was approved by Western Sydney Local Health Network Human Research Ethics Committee (Westmead). Contributors CKC, JR, AT and GSH conceived the original concept of the study. All authors contributed to the design of the study, are involved in the implementation of the project and have read and approved the final manuscript.